First of all, one of the allegations made against us is that we follow a different Holy Qur’an. This is a lie and pure nonsense. We follow the same Holy Qur’an as everyone else, the same Qur’an which was revealed to our beloved Holy Prophet may peace and blessings of Allah be upon him and there is not one dot different to any other Qur’an. Yes the translation may differ, but this is a fact that everyone of our Holy Qur’ans which contain a translation of a different language, we put the Arabic Qur’anic script side by side. We are trying for the whole world to be able to read the Holy Qur’an, therefore we are attempting to translate the Holy Qur’an into 100 different languages of the world. So far, Alhamdulillah, we have managed to translate the Holy Qur’an into over 72 different languages, but with every translation, the Arabic script is put next to it. The reason being is that it is a translation, therefore any one can go to the original Arabic text to see what it is saying and then compare our translation to it. Whilst the majority of Muslims can read the Qur’an in Arabic, unfortunately, the majority of non-Arab Muslims cannot understand fully the Arabic and need a translation to help them get the full benefit from the Holy Qur’an. The names of three cities are mentioned in the Holy Qur’an: Makkah; Madinah; and Qadian. 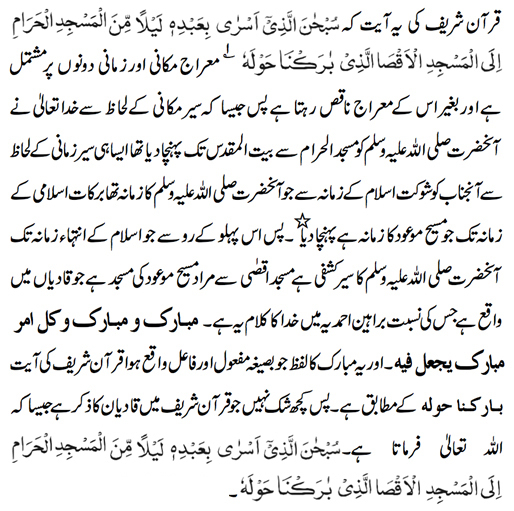 Khutbah Ilhamiyyah, Roohani Khazain Vol 16, pg 20. footnote. 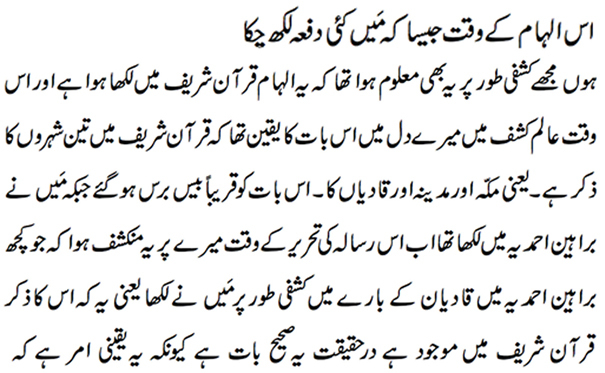 This was a revealed sermon when Hazrat Mirza Ghulam Ahmad may peace be upon him was informed by Allah to give an Eid ul Adhia sermon and he went into a sort of trance and related whatever Allah wanted him to say, but this was all in Arabic. This is why it is referred to as the ‘Revealed Sermon’ as everything he said was what Allah was telling him to say. Of course we should always understand that any Wahy that Hazrat Mirza Ghulam Ahmad may peace be upon him received were not new laws, as the Holy Qur’an is now complete, but only Allah talking to him through dreams, visions, revelations etc. comprises of both the spatial and the temporal miraj and without this the miraj remains incomplete/flawed. Thus as according to the spatial journey, God Most High took the Holy Prophet may peace be upon him from the Sacred Mosque to the Baitul Muqaddas, similarly in accord with the temporal journey, his holiness was taken from the era of the magnificence (shaukat) of Islam, which was the time of the Holy Prophet may peace and blessings of Allah be upon him, to the era of the blessings (barakaat) of Islam, which is the time of the Promised Messiah. Therefore we understand from these words of the Promised Messiah, that the verse of the Holy Qur’an relating to the Miraj of the Holy Prophet may peace and blessings of Allah be upon him was also referring to a spiritual journey of the Holy Prophet to a distant land in some future time. It meant that when spiritual darkness would envelop the entire world, the Holy Prophet would appear in a spiritual sense a second time in the person of one of his followers, in a land far away from the scene of the First Advent. This would be Hazrat Mirza Ghulam Ahmad, being the Second Advent of the Holy Prophet and the land would be the Aqsa Mosque in Qadian, the environs of which We (Allah) have blessed. 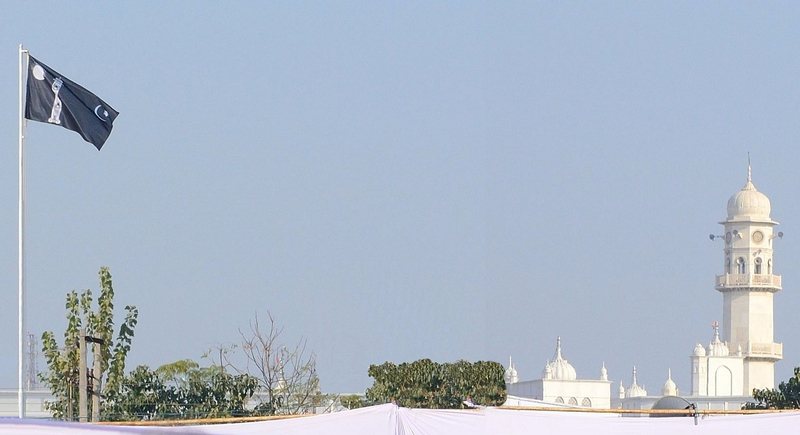 We do not take this to mean that Qadian is as high or blessed as Makkah or Madinah, that would be disrespectful to these two great holy cities, but that in this day and age another place has been blessed with a prophet and this is being supported by Allah through this vision.